As a Toronto wedding photographer I learned that creating striking pictures requires the determination and lots of practice. Just like an athlete, a Toronto wedding photographer practices at home and then performs during the event. This is exactly what happened at this Evergreen Brick Works wedding. Before the wedding the bride told me that the wedding bands and the engagement ring were important to her and her husband to be. The rings were purchased by her grandmother six months before the wedding, then grandma became sick and eventually died. As such the bride wanted to pay tribute to her grandmother and asked me to create a new wedding photo I had never done in the past. When my clients have such requests I am very impressed as I lost my father a few months before my wedding. Also, I knew that the groom was a big Lego fan so I wanted to create a new concept that included the wedding rings and Lego figurines. After some research, I found a Lego bride and groom set in Japan and ordered it. It's cost was prohibitive to say the least. At home I practice this complicated photograph using my wedding bands. Here is how I created the picture: first, I found a glass table and I positioned the wedding bands according to the rule of thirds in the fourth impact point. Next, I placed the Lego bride and groom on the right guideline according to the rule of thirds. I made sure that the rings and the figurines are in the same focus plane. The Lego bride and groom look as if they're doing a first dance. In the background, I added a purse with golden crystal beads. To illuminate the whole scene I purchased a special video light that has barn doors. That ensures that the whole scene is evenly lit. Finally, in the foreground I added a few red Christmas lights to give the photo depth. There are a few elements that make this an outstanding image. First, the glass table creates a reflection of the wedding rings and the figurines. Next, the image has three layers. In the foreground we have the red Christmas lights. The big red glows created by the Christmas lights also act as a framing device to help the viewer focus on the main subject of the picture: the wedding bands and the bride and groom. 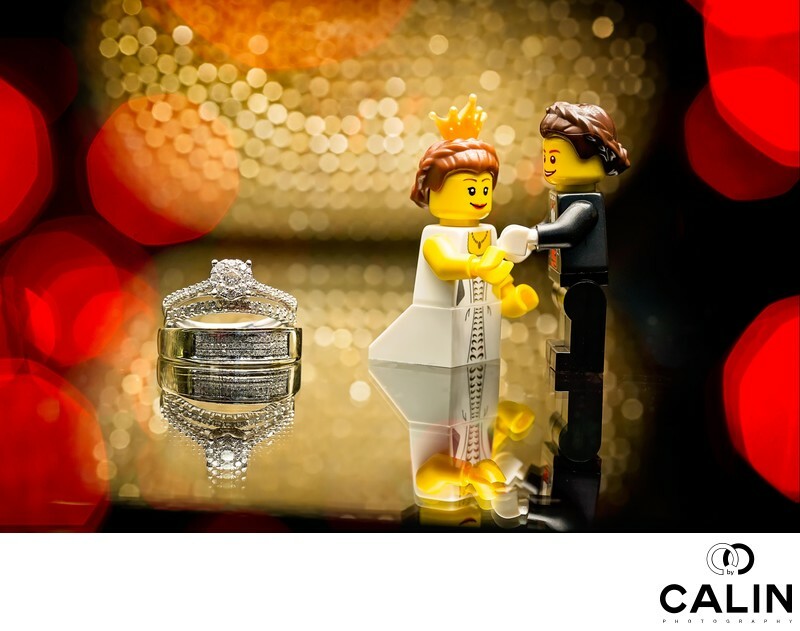 Next, in the middle ground we have the main subjects of the picture, the wedding rings and the Lego bride and groom. Finally, in the background we have a multitude of discotheque like lights slightly out of focus. The three layers give this wedding photo and an ethereal look. To create this image I used a Canon 100 mm macro lens shot at at f11. I probably took about 20 shots of this scene during the bride preparation. When I shoot under time constraints, to save time I never look at the back of my camera once the exposure is set properly. In postproduction I sharpened the wedding rings, enhanced the colour of the Christmas lights, added a vignette and did some dodging and burning. Also, I removed some dust spots on the glass table to achieve a truly special wedding picture.